Save The Dates: August Is Jam Packed with FREE Fitness Events! Is scary how fast time flies and this summer has been no different. To think that we are already heading full steam ahead into August is crazy, but this month just happens to be packed with a ton of FREE events with me! Here is your full recap of what is happening and where and how you can sign up and take part! This is the last BIG month of free outdoor fitness, so take advantage of it! Join local Pilates instructor Ali Baldassare of Equinox and North End Yoga fame, who will guide us through a 45-minute Pilates-cardio fusion class (6:30-7:15p) designed to strengthen your core, and improve your posture, flexibility and balance! Although the workout portion is free and open to the public, donations are encouraged as this month, we're supporting our gracious host, the Greenway, who maintains, programs, finances, and improves the 1.5-mile Greenway on behalf of the public. Refreshments and conversation will follow, at the Warehouse (40 Broad Street) !As an added bonus, all attendees will receive a $15 credit from sweetgreen! PS - this event is BYO Mat + water! Or ditch the mat because we're on the grass! This season has been incredible so far and now we are down to our last 2 events! If you haven't yet attended, here's your chance! You will experience Ali's signature Pilates Fusion Bootcamp which combines creative cardio drills, classical pilates sequencing, and innovative core exercises designed to challenge, strengthen, &amp; tone your entire body. DJ Johnathan Oh will be live on set spinning the hottest beats to create a unique environment to work on those summer bodies! 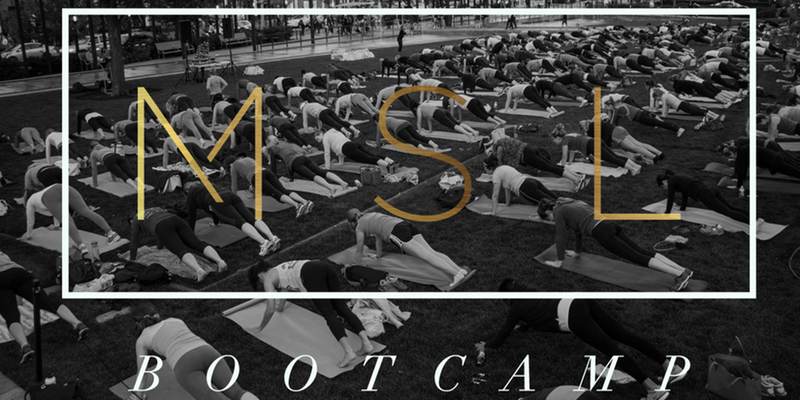 PUMA will be onsite giving out swag plus we now have official MSL PIlates Bootcamp shirts that you will have a chance to get your hands on and last but not least, BodyArmor will be there providing your hydration! Take your summer to a new level. Join us for a summer party on the Waterfront Promenade of the InterContintental Hotel. Plié and pose your way to a more conditioned physique with our mashup of two Group Fitness originals: Barre and Mat Pilates. Barre and Pilates instructors Ali Baldassare, Sara Steele-Rogers, Lauren Hefez, and Nicole Burzdak will be on hand to help you achieve optimal form and even more superior results. Boston's leading fitness trio is bringing the heat to Faneuil Hall, this summer for the second and LAST time this summer! Please join Lauren Hefez, Jennifer Phelan, and Ali Baldassare for one fierce fitness fusion! Together, they are going to get your bodies rockin' with a 45 minute fusion of athletic conditioning drills, barre, pilates and unique partner work for an intense total body burn! Everyone is welcome - men and women and we are encouraging everyone to come to class with a partner - a best friend, a spouse, a family member, etc because working out with a friend is SO much more fun! NO sign up required. Please arrive 15-20 min early and BYOM (bring your own mat) & sneakers. Any updates, changes, or further details as these dates get closer, make sure to follow me on instagram @mslali1! Even though the summer is not quite over, I'm already starting to plan for fall and that means workshops! I'd love to hear from you guys on what types of classes/workshops you want! They will be hosted at North End Yoga. Either leave a comment below or email me at ali.baldassare@gmail.com. Two events on the books for you to take advantage in October!